Well-known West-coast label founded in the early 1990's in Los Angeles by Tom Chasteen and Michael Kandel releasing ravey breaks, deep and trippy house and other sounds in a West-coast style. Best known releases are Freaky Chakra's 1994 sleeper hit "Hallucifuge" and Tranquility Bass' ambient classic "Cantamilla". Label had a brief hiatus between 1996 and '97 after which Tom Chasteen returned to take over the label on his own in 1998 to release primarily his own material. The label's renaissance reflected a diversion into even broader styles of music with many of the new releases featuring guest musicians on a variety of instruments as well as a far more expansive range of sampling sources. Musical styles as far apart as dub reggae and country and western are examples of the many genres Chasteen began fusing together over the course of the following years in an altogether succesful attempt to steer away not only from the "rave" name the label had acquired over the years but to escape the musical stagnation affecting much of the dance scene at the time. As a result Exist Dance continues to assert itself as one of the most ground-breaking labels the west coast has seen since it appeared at the start of the nineties alongside contemporary peers Hardkiss, Garth, Dubtribe et al. ED-DD-006 Michael Kandel, Wesley Owen Michael Kandel, Wesley Owen - the "God Particle"
Wonderfully psychedelic electronic dance label that solidified a west coast "dance sound" through the 90s, being somehow ( and perhaps without intending to) a bridge that started in Chi-town in the mid 80s, then migrated to the UK through the experimental band Psychic TV (who legend has it came to Chicago to perform and bought buckets of "acid" and "house" records out of curiosity and brought them back to spin them in the UK) , and then finally bouncing back to California via the influx of acid tinged British house explosion of the late 80's. While there were several vibrant electronic music hot spots here and there within the states (LA, NY, Chitown, Detroit, Miami) Existdance brought in a sound that was very representative of a whole new 'vibe". More hippy, tripped out, with touches of exotica, rock, and prog rock, all rolled up into the totally new "rave" and "acid house" of the time. You can almost see how people who grew up listening to their older siblings, parents, and local radio station pumping Led Zeppelin would naturally lead such folks to create mental dance music with a darker more spaced out energy, surfs up dude! 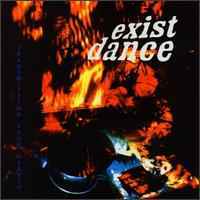 Back it the 90's, Exist Dance was responsible for some serious, yet strange underground releases. Never falling victim to the status quo, Exist Dance was able to incorporate their own brand of electronica with the help of some amazing producers. The result was a style of music that went down well on a dance floor. Then around 2000, Exist Dance records started to lose touch with their audience. Tracks like "Very Happy," were fun, but not dance floor friendly. It became harder for dj's to play new Exist Dance records, so they stopped buying them. A few years later, Exist Dance was no more. Fortunately, there is a large back catalogue of amazing releases which have yet to be discovered by dj's that are trying to map out their sounds. Anyone who looks deep enough will find what they need and discover that these blasts from the past are as relevant today as ever.